A Scottish mountain rescue team has bought two handheld infrared cameras that can "see" casualties at night more than 2km away. Infrared cameras detect body heat and also work in rain and misty conditions when normal torches or night vision aids are useless. They can be used to search large areas of steep or dangerous ground very quickly. 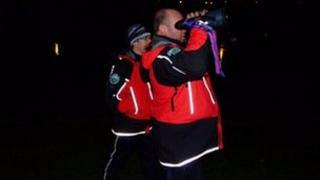 The Killin rescue team said it hoped the £9,000 cameras would save lives. The technology is the same used by the police and the military for aerial searches, but has only become portable and affordable enough for civilian mountain rescue teams in recent years. Team spokesman Bill Rose said searching for missing people was one of the most difficult and time consuming tasks that rescue teams carried out. "Current line search techniques by torchlight take considerable manpower resources and a long time to cover ground. Search dogs are invaluable in such circumstances, but cannot cover all potential search areas at one time," he said. "Infrared cameras will allow them to be utilised more effectively." The Killin team is thought to be the first rescue team in Scotland to buy the specialist cameras, which are about the size of a pair of binoculars and cost £9,000 each. Callander Community Council provided funding of £4,500 to help the team afford them. One of the cameras will be kept at the rescue team's store in the town, with the other held in Killin. "It provides a facility to check steep dangerous rocky ground at night, or avalanche-prone slopes without putting rescue team members at risk. The cameras can also detect a person hidden by trees and bushes," Mr Rose added. "It's quite a bit of money but if that is going to save someone's life, it's well worth it."